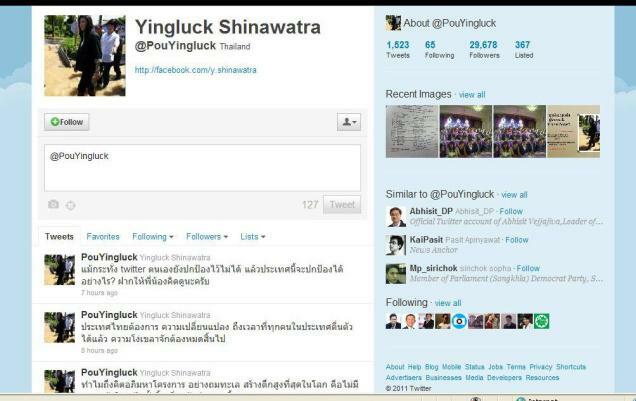 Prime Minister Yingluck Shinawatra's personal Twitter account was hacked yesterday in what officials said was possibly part of a conspiracy to embarrass the government. The false tweets accused her of cronyism and various failures. The final post read: "If she can't even protect her own Twitter account, how can she protect the country?" Authorities vowed to prosecute the guilty parties. Information and Communication Technology Minister Anudith Nakornthap said an investigation found the hacker used a prepaid phone card and an iPhone to access the accounts. He denied a report that an arrest was imminent, but said details from the investigation would be announced today.Ms. Yingluck won a clear victory in July, but is accused by her critics of being a puppet of her brother, former Premier Thaksin Shinawatra who was thrown out of office in a 2006 military coup. "This country is a business. We work for our allies, not for the Thai people. We work for those who support us, not those who differ with us," another read.